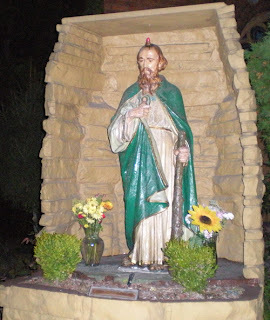 Happy St. Jude Feast Day. Saint Jude devotions occur throughout the year across the globe, but from October 20-28, there are nine consecutive days of prayer that lead up to the Saint Jude Feast Day. This period is popularly referred to as the Saint Jude Novena. Congratulations to everyone completing the 2013 Saint Jude novena. This novena – probably the second oldest continuous novenain Jersey City – has been going on since the 1930s and carried through, often against the odds, those odds including indifference by church authorities and declining interest in novenas and devotions of all kind among subsequent generations. Jersey City’s Saint Jude Novena began at Saint Lucy’s church, it is believed sometime during the Great Depression, if not earlier. Immigrant families brought the tradition over from Italy and Poland. Saint Jude crosses nations, the rare devotion not dominated by one culture. In the 40s and 50s, the ranks of Puerto Rican, Dominican and other Spanish ethnics began to grow in town, they eagerly adopted the tradition, which had also been taking place in their respective homelands. 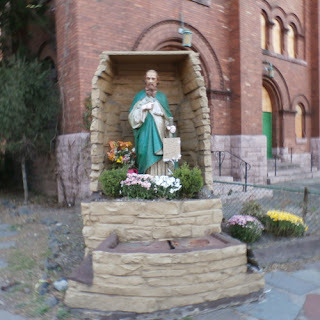 I recently talked to an elderly woman and veteran of that battle for Jude near the Hoboken border, and she told me she still goes to Saint Lucy’s for Tuesday prayers. She will not go to Saint Michael’s, mainly because of how the transition was handled. Emotional connections to belief always run strongest of all human feelings; look at the Shia/Sunni wars, the 100 years war, or the millions Atheists spend to get under God stricken from the Pledge. Sure enough, check out the cardboard sign on the Saint Lucy statue – Novena services are being held here, a secret society, praying to the Patron Saint of Lost Causes &Desperate Situations, uninterested in any official sanction by Catholic Church Authorities. 30 years later, there people who gather here to pray outside, even though the shrine in that church is in another church just six blocks away. Now, these folks for whom the cardboard sign is for, they still go to another church for their Sunday obligations, yet for Jude those prayers are still said here, where they had been going since childhood. But thus is the conflict between Faith, and Religion. The latter is man-made and subject to whims of history and who is in power, like all things man-made, imperfect and biased; the former is between God and each individual soul. In 1548, Pope Paul III, granted a plenary indulgence to all who visited St. Judo’s Tomb in the Vatican. 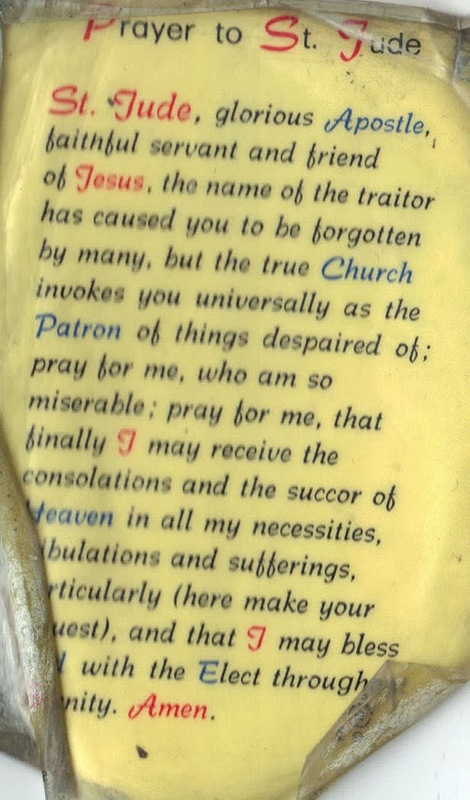 This indicates a thriving devotion to St. Jude that most likely existed for centuries before then. 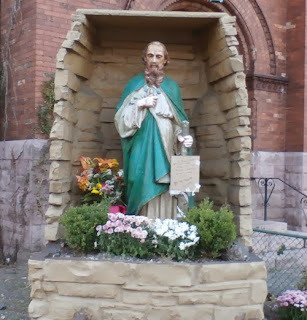 In fact, earlier church records show that in 1153, Saint Bernard of Clairvaux, requested that a relic of St. Jude be placed on his chest and buried with him. In the 13th Century, Saint Bridgett of Sweden, a renowned catholic visionary, in one of her mystical visions proclaimed the sacredness of devotions to Saint Jude. Scholars conclude, that centuries before P-3 acknowledged Jude devotions, those devotions were popular among the people. Saint Jude devotions, including veneration of Saint Jude relics (after martyrdom in Persia, his remains were sent to Rome and he is interred at the Vatican), were never part of the dispensation and indulgence that so enraged Luther and led to the Reformation. Saint Jude (not Iscariot, as Saint John’s Gospel refers to him) is the people’s saint and never tainted by the justifiable Protestant arguments. Saint Michael has scaled back their novena devotions and eliminated their special 7:15 PM feast day mass – there are prayers at that time – so, for the first time since 1986, there will not be a special Saint Jude Mass at the church that houses the only Saint Jude Shrine in Jersey City. Irony thinly camouflages tragedy. The Saint Jude statue at Saint Lucy has also been vandalized. The “flame” – the holy spirit, as depicted in the Acts of The Apostles – atop his head has been broken and it looks like his hands have been marred by paint. I was here in November and didn’t notice this apparent destruction so the act was recent. Here’s an older picture, compare and contrast. Saint Jude is about commitment to prayer. We ask for intercession, we verbalize heart-felt supplications. 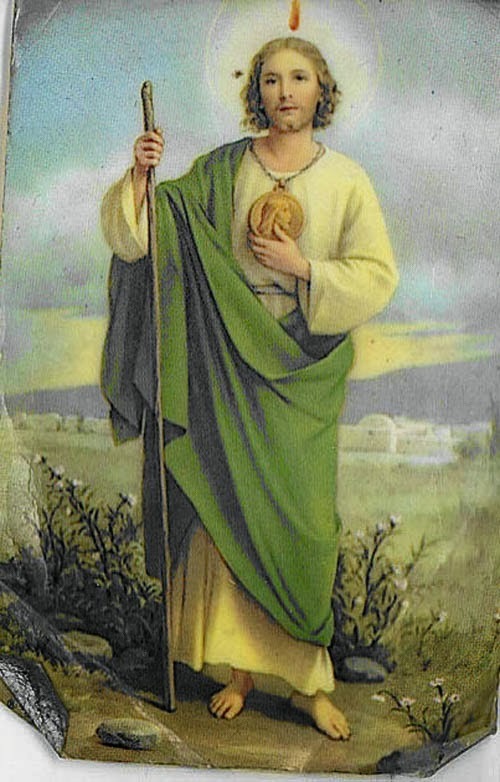 Saint Jude embodies the love of God; He knows what is in your heart. We are never alone. Ultimately, the answer to prayer is prayer, a kind of eastern paradox, a sort of gnosis that Pope Benedict touches on his Encyclical on the virtue of hope . Saint Jude gives us hope. 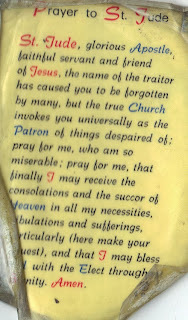 The Saint Jude Prayers and accompanying novenas are not to Saint Jude . They ask Saint Jude to pray for us. 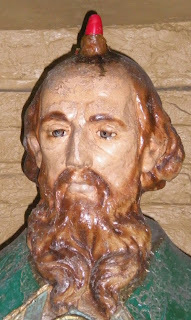 A Saint Jude statue is considered “big box office” by most pastors, because of the popularity among the people, have a Saint Jude statue, donations will follow. But Church leaders hardly ever actively encourage Saint Jude devotions. The Archdiocese of Newark or New York never issues statements about Saint Jude on his feast day. Compare that to their annual Proclamations for Saint Patrick. 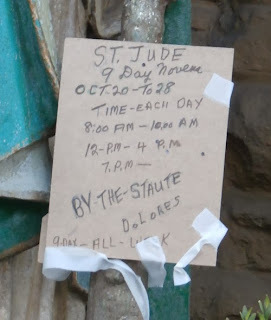 This benign neglect – tantamount to a soft suppression – is evidenced in Jersey City by the Saint Lucy Jude devotion continuing outside of sanctioned circles while at the same time Holy Rosary ended its weekly devotion to Jude (and Saint Anthony and Saint Joseph) a couple of years ago and Saint Michael drastically cutting back its Jude Novena and Feast Day services. Well, we’re all under financial constraints aren’t we? There’s good excuses aren’t there? 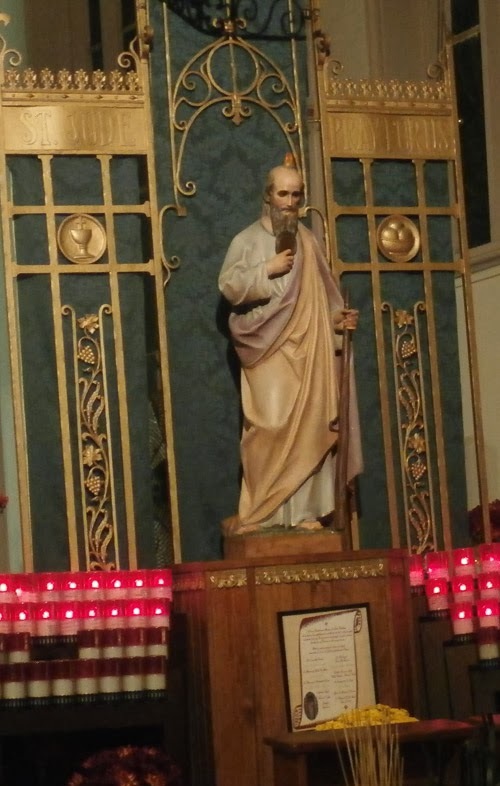 Jersey City has a rich catholic tradition, but the fact is the Jersey City churches are now more memorials to that tradition than its living embodiments. Attendance has steadily declined even as the population in town soars. It’s not only the hipster spawn of those authority-rejecting baby boomers not going to church, but this attendance decline is apparent in Hispanic and other communities, who are traditionally catholic and also growing in numbers. The declines are not being off-set, they’re happening in every community. What about the Italian Feast, whose wonderful services at Holy Rosary are well-attended, Most of that parish lives in the suburbs now, and when the feast is not taking places, the pews are more empty than filled. Holy Rosary is supported by patrons who go elsewhere on Sunday (Suburban churches in New Jersey are doing surprisingly well). When August is over, so their reunion. In Jersey City, catholic schools are closing or merging (then closing) and Mass Attendance is getting lower and lower. Parishioner rolls are falling off, there is scuttlebutt that one or more of the remaining downtown churches will close in 2013 (Saint Peter and Saint Boniface closed in the 00s). What is happening in Jersey City is happening all over the world, well in the rest of the United States and Europe and much of South America at least. Gee, do you think that protecting child-rapists, promoting anti-gay bigotry and opposing birth-control as part of healthcare plans while knowing the majority of married and unmarried Catholics use birth control, might have taken a toll on attendance and contributions, especially in already pro-choice urban enclaves? You think? A smaller but more orthodoxly pure church: what a load of crap. Hypocrisy has driven people away, and distracts from the good work, like the St, Lucy shelter in downtown or the indisputable fact that the Catholic Church is the largest provider of healthcare in Africa! With U. S. church leaders (thank God for Pope Francis!) conducting themselves like they have been in recent decades, who is going to miss, much less notice, their local revival of Jude devotion suppression? I guess I’m the only one noticing it and most ears are deaf to my cry. I believe in my soul. I believe in your soul too but I also believe that’s your business and your responsibility and living in the same world that you do I have to tell you that my hands are full right now trying to act on what I believe. I can’t be bothered about what you believe, think or feel. I have my own doubts and challenges. You want preaching, condemnation or affirmation, go to another blog. I am only able to tell you some things about the Jude traditions. The rest is up to you.